Some Christians are completely opposed to borrowing.1 Verses such as Romans 13:8, “Owe no one anything except to love one another” and Proverbs 22:7, “the borrower is servant to the lender” are used to support this position. My own view is that borrowing is permitted in the Scriptures, since the Scriptures provide regulations with regard to lending (cf. Ex. 22:25; Lev. 25:35–37; Deut. 15:7–9; Neh. 5:7; Ps. 15:5; 37:21, 26; Ezek. 22:12; Matt. 5:42, “from him who wants to borrow from you do not turn away”; Luke 6:34). The broader context of Romans 13 speaks of paying “all their due” (Romans 13:7), so the teaching of Scripture is that one should honor debt agreements and pay on time. Good debt includes anything you need but can’t afford to pay for up front without wiping out cash reserves or liquidating all your investments. In cases where debt makes sense, only take loans for which you can afford the monthly payments. Bad debt includes debt you’ve taken on for things you don’t need and can’t afford (that trip to Bora Bora, for instance). The worst form of debt is credit card debt, since it usually carries the highest interest rates. Borrowing prudently to purchase a home in these cases: 1.) One intends to stay in that home for at least 5 years; and 2.) after one has done a thorough rent vs. buy analysis for that location. Borrowing to procure transportation for a job, with the rationale that the job will enable one to provide for self and pay off the auto loan. Taking a vacation using debt. A vacation is postponable! Buying technology products (eg. a computer, smart phone, or audio/visual equipment). These items depreciate quickly and will soon be obsolete. Paying with a credit card technically is borrowing; but in my view, if one pays the credit card off completely at the end of the month, it is using credit wisely. An unsecured loan has no collateral. Secured loans provided the lowest APRs and could be considered “good debt.” Revolving debt on a credit card would be an example of an unsecured loan. There are many ways to borrow money. Some are better than others. 1. 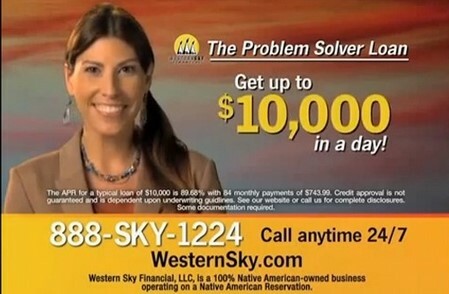 Western Sky Financial: At least they were upfront about their interest rates—as high as 355%. Sued by attorney generals of many States,6 they finally ceased making loans. 2. Payday loan: A payday loan (also called a payday advance) is a small, short-term unsecured loan. These loans have very high APR and are generally regarded as predatory loans. Many payday loan shops are found in store-fronts in lower income areas. An online example is www.cashadvance.com which has rates as high as 1,546%. 3. The car title loan: Not offered in all states. One’s car is the collateral for the loan. The amount a borrower can be loaned is dependent on the worth of their vehicle. A lender will typically look up the auction value of the car being used as collateral and offer a loan that’s between 30% and 50% of the worth of the vehicle. This leaves lenders a cushion to make profit if ever they need to repossess the vehicle and sell it at auction, in the event the borrower defaults. 4. Pawn shop: “A pawnbroker is an individual or business (pawnshop or pawn shop) that offers secured loans to people, with items of personal property used as collateral.” As an aside, I find pawn shops to be an interesting shopping experience. There are organized ways to formalize loans among friends. This arrangement has been called “direct peer to peer lending (direct p2p).”7 An example website is http://www.lendingkarma.com/ where a lender (typically a friend or family member) can create a legally binding loan agreement. Peer to Peer lending is relatively new. The two main Peer to Peer sources are Lending Club and Prosper.com. Peer to Peer lending and borrowing omits the bank as the middle-man and connects individuals who have money to lend with those who desire to borrow. I have some experience with being a lender on Prosper. I barely broke even and decided that loan banking is not the business I wish to be in. The peril of outstanding credit card debt is that the APR is extremely high and it is difficult to dig oneself out of this sort of debt. Bankrate.com provides a helpful calculator that graphically reports how long it requires to pay off a credit card paying only the minimum required payment. Some forms of debt, such as credit cards (often called revolving debt) and payday loans, are considered short-term and should be paid off as quickly as possible. hurt your credit rating, making other credit and insurance more expensive. our credit cards old fashion charge accounts. Something to consolidate various purchases to be paid off at the end of the month. Our biggest charges are for gas at Costco.